The most remote football manager in the most remote island of the world. This is Leon Glass, the man who has the charge of organizing all the football played on Tristan da Cunha, a group of islands dispersed in the middle of the Atlantic Ocean which count about 260 inhabitants. AsianOceanianfootball caught up with him to discuss the influence of the most popular sport in the most unknown place on Earth. Give us a general introduction of football on Tristan da Cunha. Football on Tristan is a very popular sport, but due to the small population of the island it is hard to form an 11-a-side team, so we usually play 5-a-side and we have two competing teams. How football managed to arrive on the islands? I don’t remember the exact dates but it was introduced by missionaries to the island and I think military personnel on visiting ships. What about Tristan da Cunha national team, has it played any matches? At the moment we don’t class ourselves as a national team, we don’t have the facilities or the funds to leave the island so all our matches are classified as friendlies. 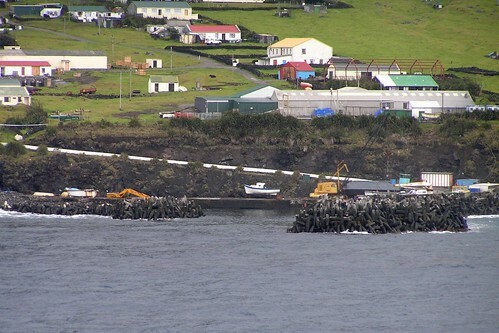 According to some sources, Tristan da Cunha is a potential member of the CSANF, the South American Board of New Federations. Are you interested in taking part in this board and have you ever heard of it? We were approached by CSANF a few years ago but we could not join because of the reasons in the above answers in question 1 and question 3. What are your plans for the 2012/13 upcoming season in football? We don’t make any official season plans as our matches vary but we try to train at least once a week to keep sharp. How many matches do Tristan da Cunha’s selections manage to play every year against ship’s teams or other teams? Again these matches vary from about 3 to 6 matches a year, although we would like to play much much more. How many matches did you play in 2012 and which have been the results? In 2012 we only played 1 match and that was our annual 5-a-side cup where our team is split down the middle with Tristan Government employees on one side and our Fish Processing Factory employees on the other. The Government team won the closely contested match 2-1. Which is your exact position in Tristan da Cunha football? My role at the moment is player manager, I organize the training sessions, order the team kits and take part in some of the matches. We were recently invited to a 5-a-side tournament in Mallorca, but because of shipping schedules and lack of time to secure travel funding we could not attend, we would like very much to compete and do well in a tournament like this. Is there a local championship played on the island? Yes, the local championship is called the Table Bay Marine Cup and it’s the one I’ve mentioned before. Do you think it will be possible to see one day Tristan da Cunha playing against other ‘neighboring’ islands, like Saint Helena? It’s rumoured that TDC lost 9-0 a game versus Saint Helena, but there’s no source confirming that, is it true? We would like to play against the neighboring islands if it one day becomes possible, we have never played any of them before, so the rumour that we lost 9-0 to St Helena is just a rumour. Which is Tristan da Cunha’s biggest success in football so far? It is hard to say which is our biggest success so far as we have played so few matches, but the game we are most proud of is a few years ago when a South African construction team was visiting Tristan for several months, after playing two close matches that ended at 4-4 they challenged us to one final game before they left and dared us to put our recently won Trophy on the line. The result was Tristan Da Cunha – Apple Construction 14-2. Tristan da Cunha’s teams played against Norwegian and American ships around 1940s. Do you have any info about those matches? Yes through some of the history books Tristan teams did play these ships but I don’t have any info about them besides that they were played. Do you have any chance of watching some football on tv? We Follow the English Premier League on TV also the Champions League and all of the international competitions. Do you have a favourite football team? The majority of my team like me supports Man Utd but a few in the team also like Arsenal and Liverpool.